When it comes to architecture, churches have always had some of the most awe-inspiring, beautiful designs. Each culture and religion has added their own influence on the church design, some making use of the traditional Roman architecture, and some innovating entirely unique designs. 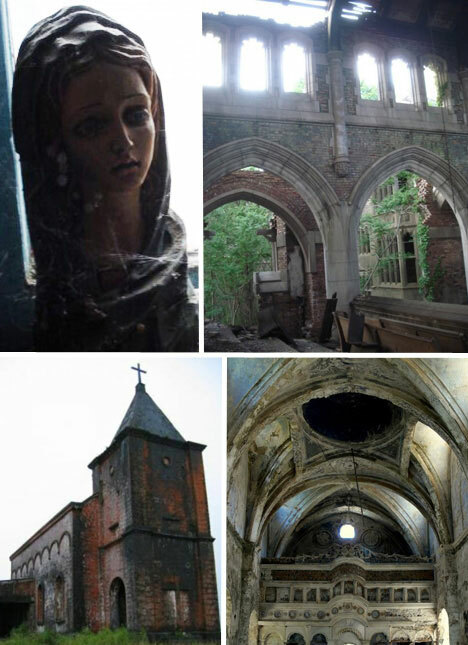 Below is a collection of photographs from seven amazing abandoned churches from around the world. What was once a small farming town in Young County, Texas stands today as a relatively well preserved ghost town. South Bend can be found at the intersection of SH-67 and FM-701. The town was abandoned in the early 1920’s when a small oil rush drove many inhabitants to new lands in search of better paying work. Very few of the town’s buildings are still inhabited, with 75% of the town empty and abandoned. Located in Williams County North Dakota, this church also has a small cemetery around back. Named St Olaf Lutheran Church, the building looks to have abandoned for quite some time now. Explorers report that the inside is quite bare, except for an organ that was used during ceremonies and some stray pews. This abandoned house of worship is located on Bokor Hill in Bokor, Cambodia. The church is of the Catholic tradition and is comprised mostly of red brick. In 1979, the church was the site of a major battle between Khmer Rouge and Vietnamese forces. The Khmer Rouge defended the church quite well and it suffered no serious exterior damage. The exact construction date of the church is hard to determine, but judging by the other construction that took place in the area during the 1920s, it is reasonable to assume that the church was erected around the same time. Located in Gary City Indiana, the Gary City Methodist Church was closed in the 1970’s due to a lack of attendance and was damaged in a fire in 1977. Surprisingly, the church still stands defiantly against the wrath of time and elements. This great church has two floors and was built in traditional roman fashion. Tall arches, pillars and well intact stained glass (over the main altar) serve to preserve this church’s gorgeous essence. Located in Detroit Michigan, the Universal Hagar’s Spiritual Church was built in 1923. The church served a new religion led by George William Hurley which combined aspects of spiritualism, catholic ritual, holiness preaching, voodoo and astrology. The church still stands today, one of the few that remain in the area after Hurley’s death. Despite the passing of the leader, the religion continues to grow each year In the southwest and California. Today, St Mark’s Church in Silvertown London has been fully restored and no longer appears lonesome and abandoned. However in the 1980’s the church was in the state it appears above. Constructed in 1892, the church served the community ads a beautiful place of worship until its closing in 1972. In 1981 it was ravaged by fire and much of it was destroyed or seriously damaged. Located in Kayakoy, Greece, this church, as well as the entire town has been totally abandoned since 1923. Most people were forced out during the war between Greece and Turkey, leaving behind their homes and this church. Tall ceilings decorated by elegant sculptures line the inside of the main cathedral. One can find may examples of traditional Greek art meshed with Roman architecture throughout the majority of this rather large church. The interior has survived to present day in relatively good condition, inviting us to explore its history first hand.